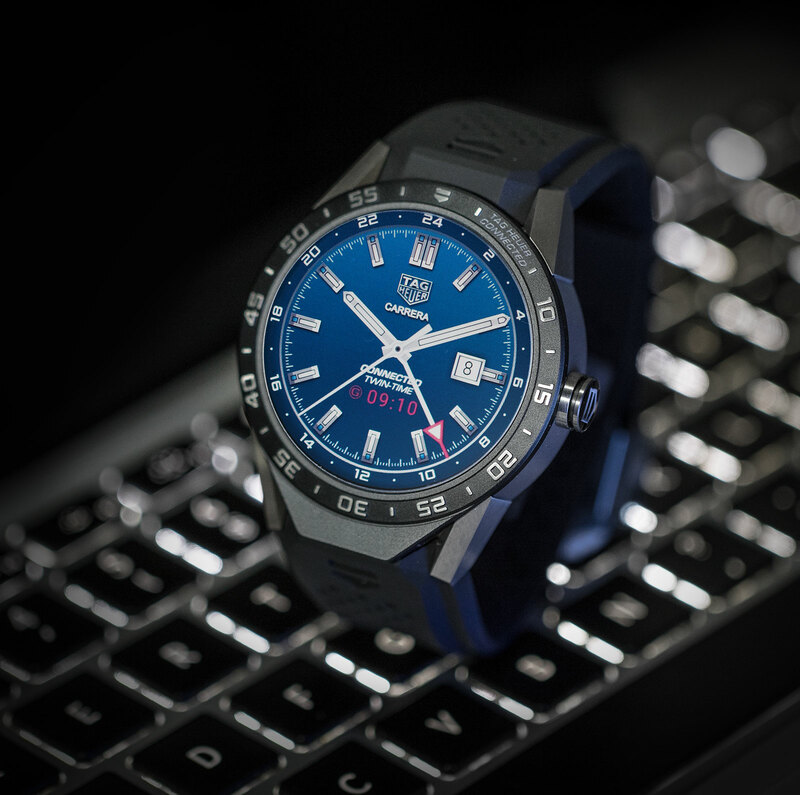 TAG Heuer has just taken the covers off TAG Heuer Connected, a titanium smartwatch running on Google's Android Wear platform and powered by an Intel processor, but one that also features dials that mimic a mechanical watch. After several months of energetic promotion by its irrepressible chief executive, Jean-Claude Biver, TAG Heuer has finally introduced TAG Heuer Connected, a smartwatch similar in form to the mechanical Carrera Calibre 01 – essentially an Android Wear smartwatch packaged inside a TAG Heuer watch case. 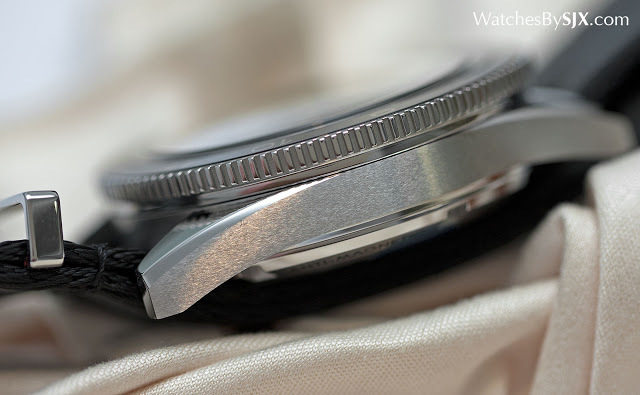 The case is 46mm in diameter and entirely in titanium, with a scratch-resistant sapphire crystal on the front. It even has three dial options that reproduce the look of a mechanical watch, offering dials featuring a chronograph, GMT or time-only functions on its large, 1.5-inch screen, that are each similar to mechanical Carrera watches in the TAG Heuer collection. Additional watch faces will soon be available for download. Though TAG Heuer Connected looks and feels like a traditional watch on the outside, the inside is entirely electronic – a drastic about-turn from the $400,000 double tourbillon-chronograph the brand unveiled, and then killed, last year. 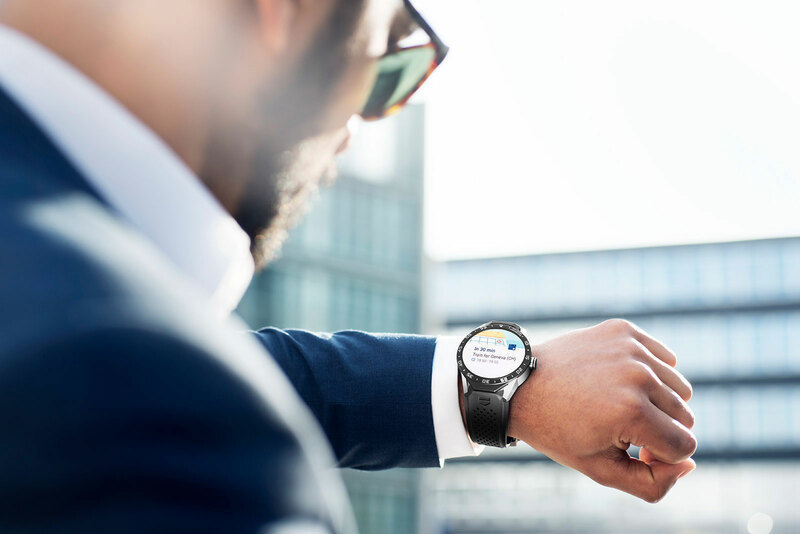 Powered by an Intel dual core processor, the smartwatch runs on Android and can function on its own, without the need to be connected to a phone. But it can also sync with Android and Apple iOS smartphones. The TAG Heuer Connected has 4GB of memory, giving it plenty of space for songs and apps. Because it runs on Android, the TAG Heuer smartwatch is compatible with the thousands of apps created for Android like Google Maps. On a full charge it’ll run for about 25-hours with average use. 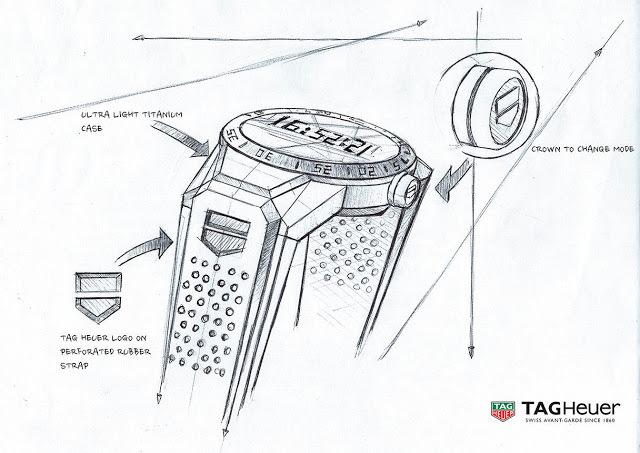 Despite being a true smartwatch, TAG Heuer is still hedging its bets. The TAG Heuer Connected watch can be traded-in – along with a payment of US$1500 or whatever the retail price of the smartwatch is locally – for a basic, mechanical Carrera automatic within the smartwatch’s two year warranty period. Essentially the owner of the TAG Heuer smartwatch gets to convert the electronic timepiece into a mechanical one for a cost that’s double the retail price of the smartwatch. 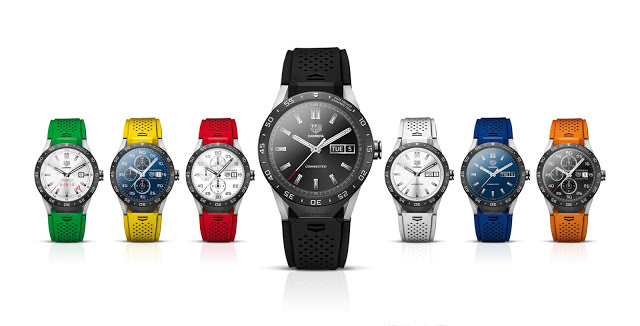 Offered on a rubber strap in seven colours, the TAG Heuer smartwatch is priced at US$1500 in the USA, SFr1400 in Switzerland, while in Singapore it’s S$2100. It is available from TAG Heuer’s dedicated website, and also its brick and mortar watch retailers. More details on this later in the week. Phillips will showcase timepieces from the upcoming The Hong Kong Watch Auction: One on Singapore and followed by Taipei, before the sale on December 1. Led by Sam Hines and Aurel Bacs, the auctioneer’s inaugural watch sale in Asia takes place on December 1 in Hong Kong, with 357 lots on offer. The Hong Kong Watch Auction: One will take place less than a month after Phillips‘ Geneva auctions, which saw several records set, including that of the most expensive wristwatch ever sold at auction. A significant number of highlights from The Hong Kong Watch Auction: One will be in Singapore and then Taipei, Taiwan. The Singapore preview will be in Windows West on the 20th floor of the Four Seasons Hotel located at 190 Orchard Boulevard. The exhibition is open from 11:00am to 6:30pm on November 14 and 15. And the Taipei leg will be in Residence II on the ground floor of the Grand Hyatt Taipei at 2 Song Shou Road, open from 11:00am to 6:30pm on November 21 and 22. The sale itself takes place in Hong Kong on December 1, at the Four Seasons Hotel, with previews daily on the preceding three days. Auction information and the full catalogue for the Hong Kong sale is also available online. Prominent on Daniel Craig's wrist throughout the recent James Bond instalment Spectre is the Omega Seamaster 300 Spectre limited edition. 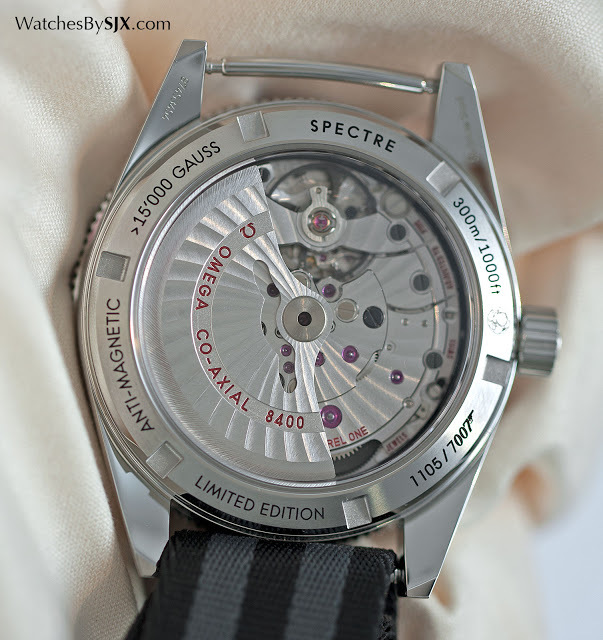 We take a look at the latest 007 wristwatch. At a critical juncture in Spectre the Omega Seamaster 300 on James Bond’s wrist does it thing, allowing the spy a narrow escape from a painful demise. The Seamaster 300 Spectre available to the public lacks the volatile properties of the fictional version, but is nonetheless a satisfying combination of vintage-inspired styling and a high-tech movement. 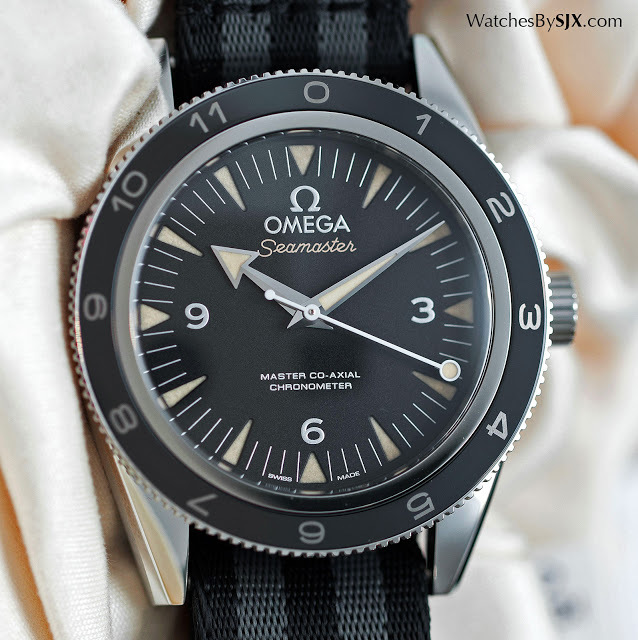 Actually the second, but more prominent, wristwatch worn by Craig in Spectre (the first was the Seamaster Aqua Terra >15,007 Gauss), the Seamaster 300 Spectre is a variant of the Seamaster 300. It’s a retro-style dive watch modelled on the reference CK2913 of 1957, Omega’s first modern day dive watch. Much like the record-breaking Tudor Black Bay One, the Seamaster 300 Spectre is a pastiche of elements from vintage dive watches. Although it’s a medley, the result works well. The Spectre edition is similar to the ordinary model, but with tweaks that make it a bit more novel, and a more vintage feel. 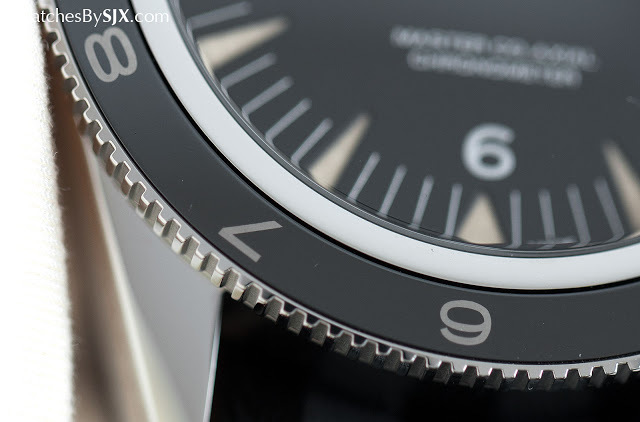 To start with the bezel is a bidirectional 12-hour bezel – and this plays a role in the movie – instead of the typical elapsed time dive standard for dive watches. Able to track second time zone (somewhat crudely since it can’t distinguish between night and day), the 12-hour bezel is black ceramic, meaning it’s scratch resistant though its glossy finish is at odds with the vintage look. 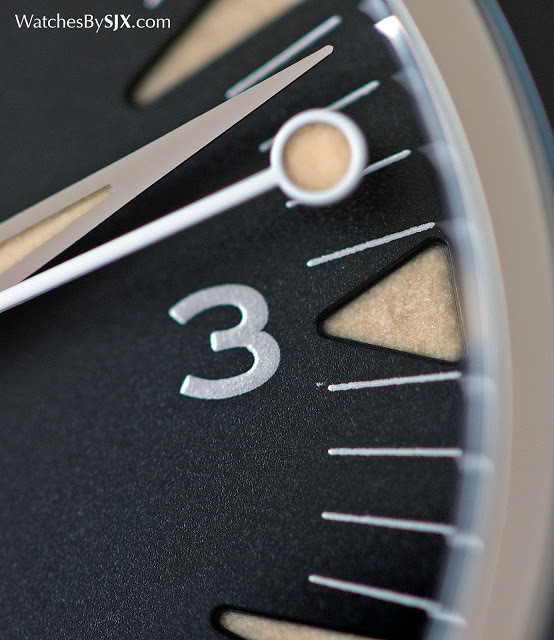 Instead of the lance-shaped seconds hand, the Seamaster 300 Spectre has a lollipop hand, a feature found on early models of the vintage Seamaster 300. 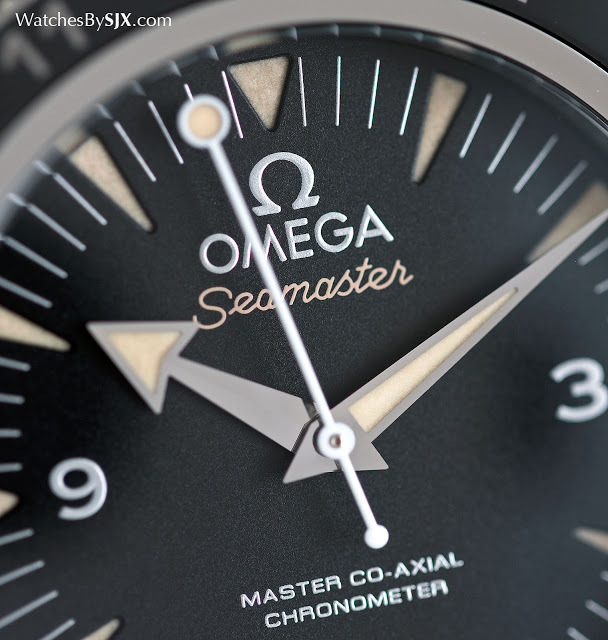 And the 12 o’clock marker has been replaced by an enlarged Omega and Seamaster logo, which is surprisingly unobtrusive despite its size. 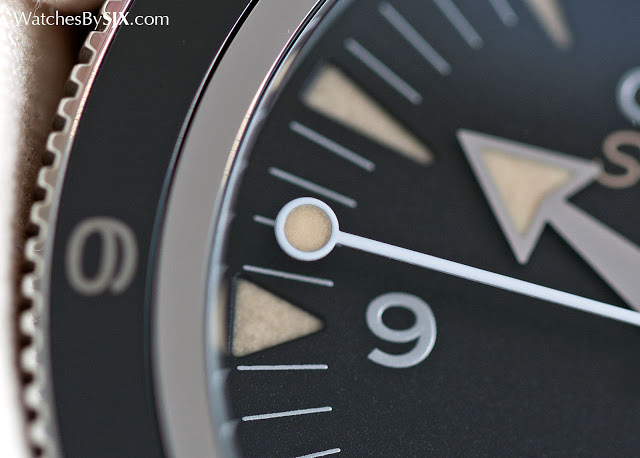 The dial has a matte, grained finish with a sandwich construction, so the Super-Luminova is on a plate underneath the dial, which has apertures cut out for the markers. As is the fashion for such retro-style watches, the luminous material on the dial and hands is ivory to mimic the patina on actual vintage watches. Polished on the top and brushed on the side, the case is neatly finished. It’s identical to the standard model, 41mm in diameter, which as Goldilocks would put it, is just right. Because the bezel is wide and the dial dark, it actually seems smaller than 41mm on the wrist, which suits the vintage look well. 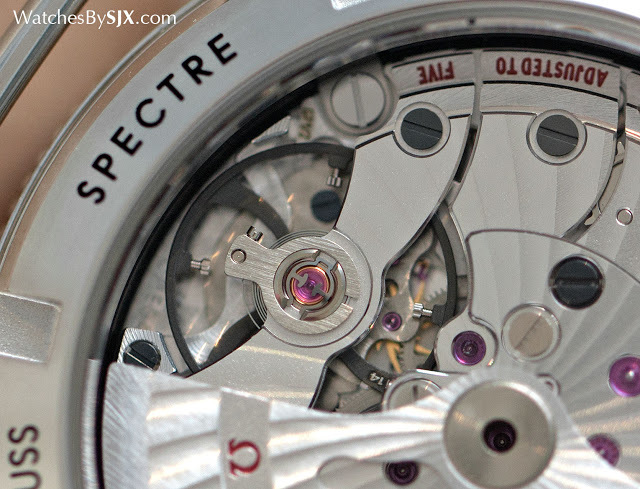 Although the aesthetic leans heavily on the past, the movement is as good as it gets in terms of technology. The Master Co-Axial calibre 8400 is equipped with all the features Omega has developed in recent years, including exceptional magnetism resistance thanks to Si14 silicon hairspring and patented alloys. The movement is immune to magnetic fields of up to 15,000 Gauss, equivalent to that generated by smaller magnetic resonance imaging (MRI) machines, a level that would stop an ordinary timepiece. 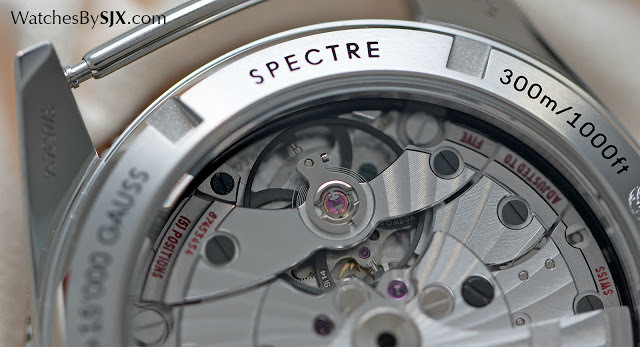 And unlike other magnetism resistance movements that rely on soft iron shielding to protect the movement, the calibre 8400 can be seen through the sapphire case back since its magnetism resistance is due to the materials used in its construction. Decorated attractively, but obviously by machine, the style of the movement is characteristic of the current generation of Omega calibres. It’s finished with a radial striping, with blackened screw heads and red filling for all the engraved text. 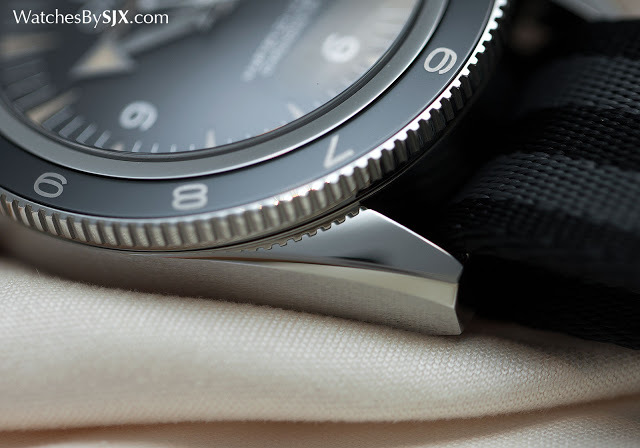 The Seamaster 300 Spectre is packaged with a black and grey stripe NATO strap, as well as a steel bracelet. It’s worth noting the steel bracelet is entirely brushed, giving it a more appealing and appropriate look than the bracelet on the ordinary model, which has polished centre links. 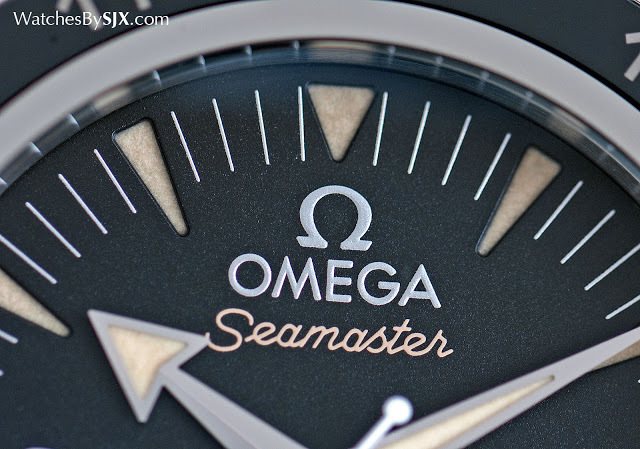 The Seamaster 300 Spectre is limited to 7007 pieces, an enormous number by most standards but likely just enough since Omega is an enormous brand and James Bond is an even larger franchise. Even though so many will be made, none will likely be left on the shelves in a year’s time. It’s priced at SFr6300 and in Singapore, it’s S$9800. That’s an acceptable 15% premium over the ordinary Seamaster 300. Worn by James Bond in the latest instalment of the spy franchise, the very same Omega Seamaster 300 SPECTRE will also be available to the public in a 7007-piece limited edition.